1. 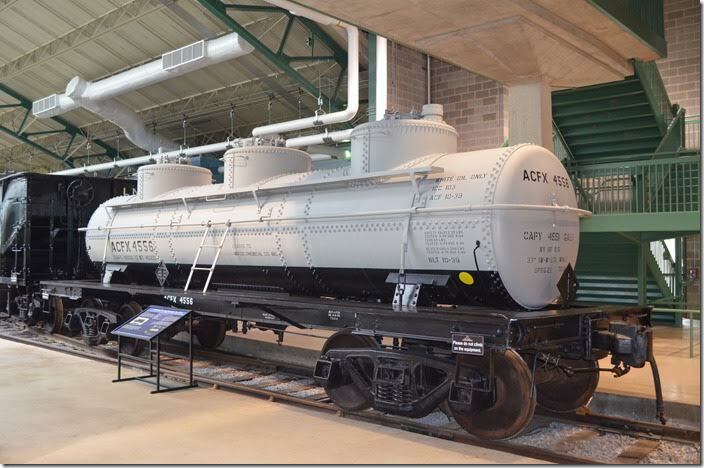 ACFX 3-compartment tank car 4556. 2. ACFX 4556 display board. Click on image for a larger view. 3. 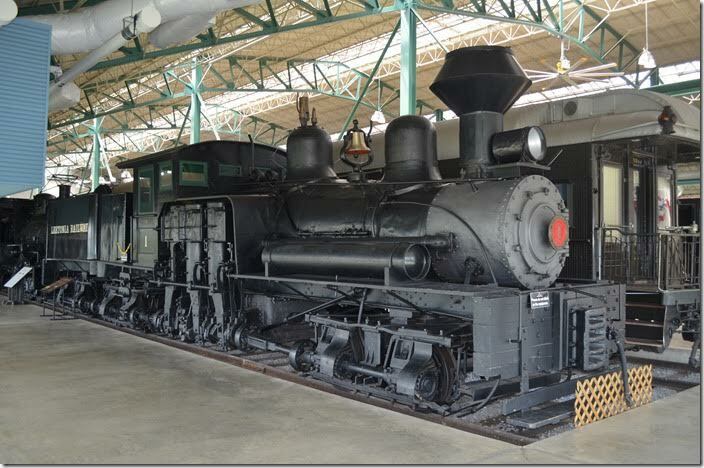 The Pennsy No 94 A5s class 0-4-0s were most useful around the ports along the Delaware River at Philadelphia. 4. 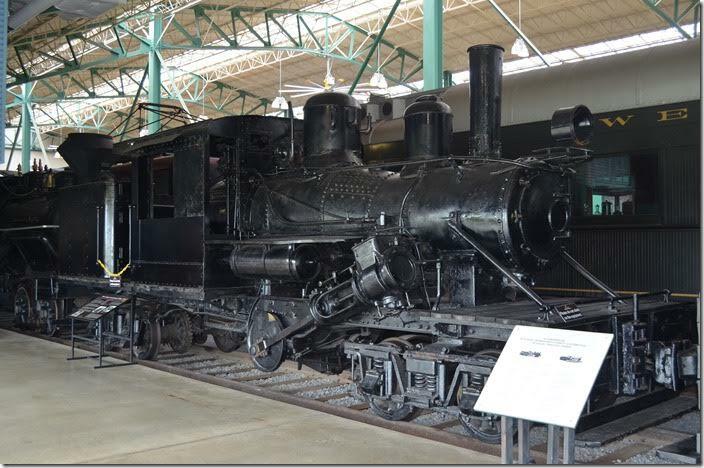 Most “fireless cookers” were 0-4-0T or 0-6-0T (C&O’s), but this is an 0-8-0T! 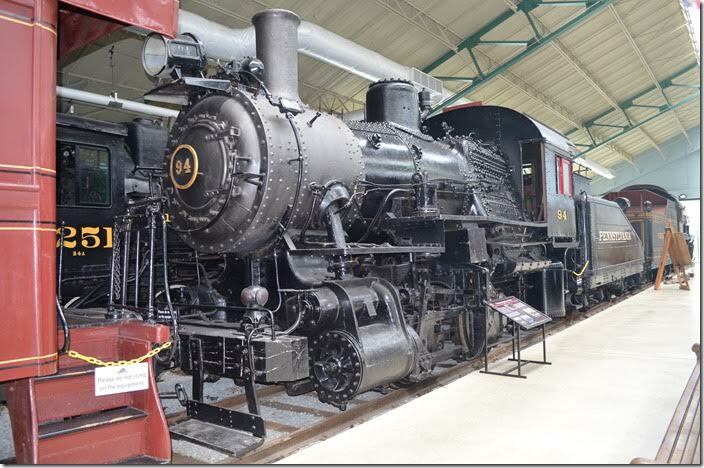 It is the only 0-8-0T fireless ever built! 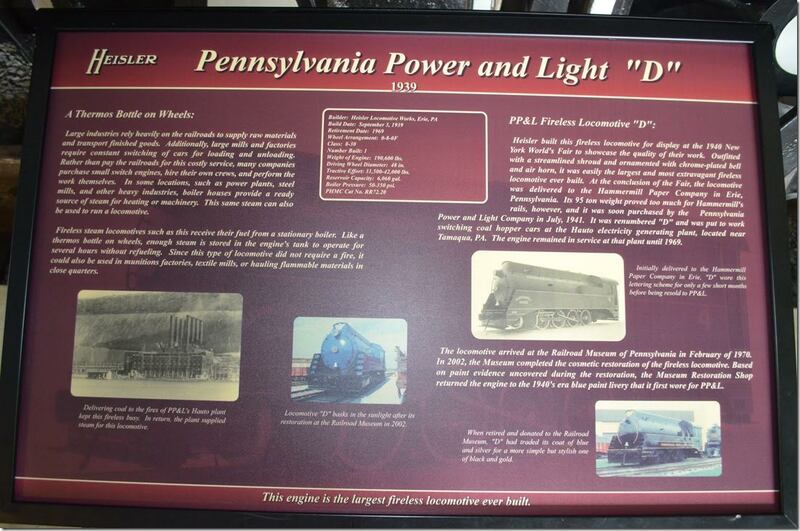 PP&L D fireless. 5. 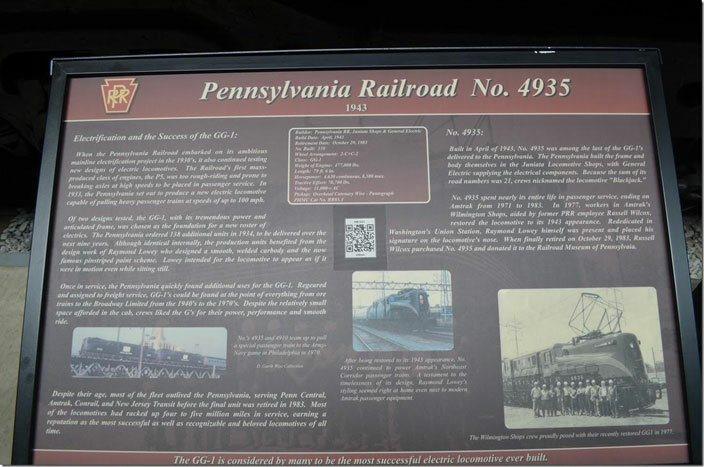 PP&L D display board. Click on image for a larger view. 6. 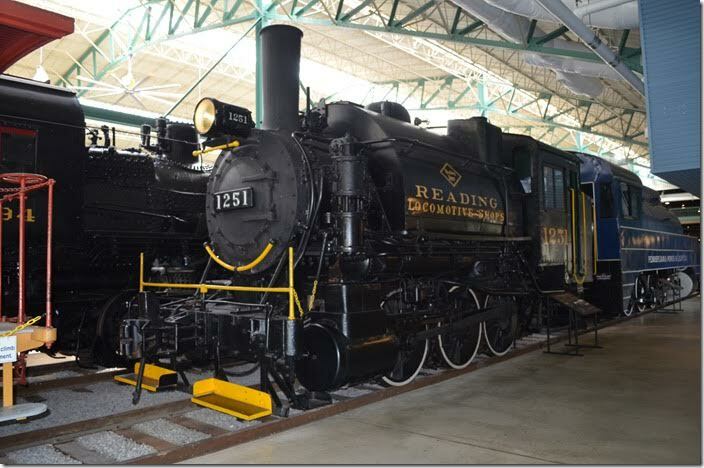 Reading Co. 0-6-0T class B4A No 1251 built by Reading Locomotive Shops in 1918. This was the “shop goat” used at Reading shops and roundhouse. 7. RDG 1251 display board. Click on image for a larger view. 8. 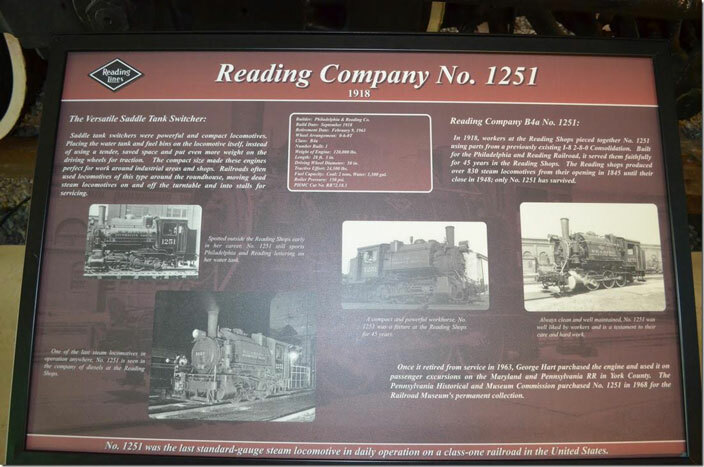 RDG No 1251 B4a. View 2. 9. 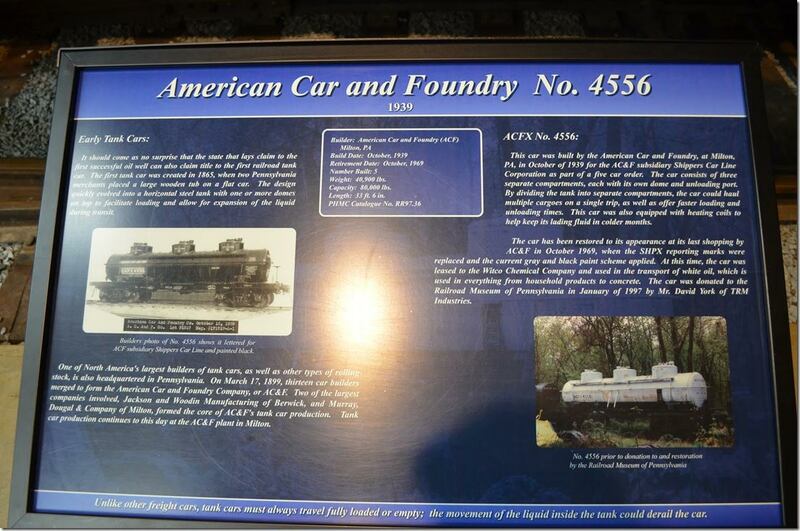 This car would be ideal for railfans!! The Cumberland Valley is now Norfolk Southern’s main line from Hagerstown to Harrisburg. CV combine B. 10. 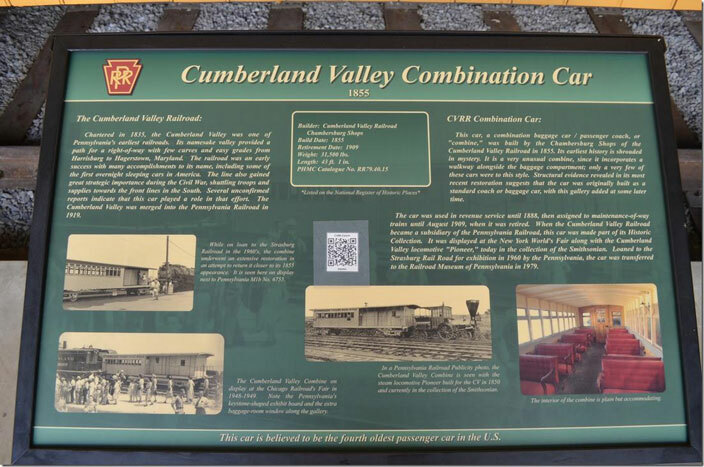 CV combine B display board. Click on image for a larger view. 11. Leetonia Railway 3-truck Shay no. 1. Read the text...this is actually Ely-Thomas Lumber no. 2 from Fenwick, WV!! 12. 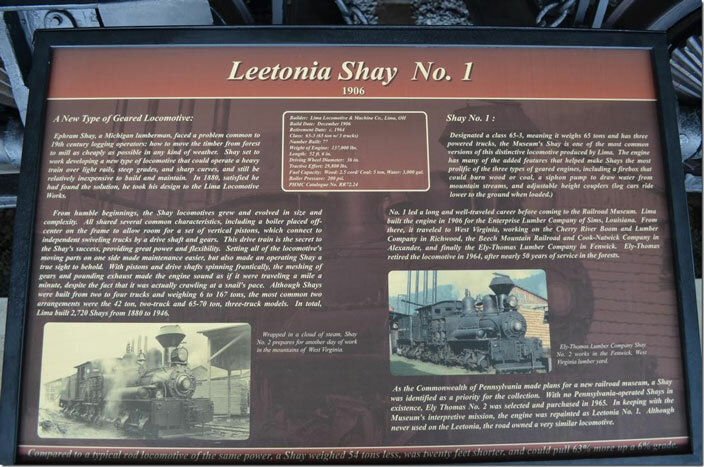 Leetonia Shay 1 display board. Click on image for a larger view. 13. 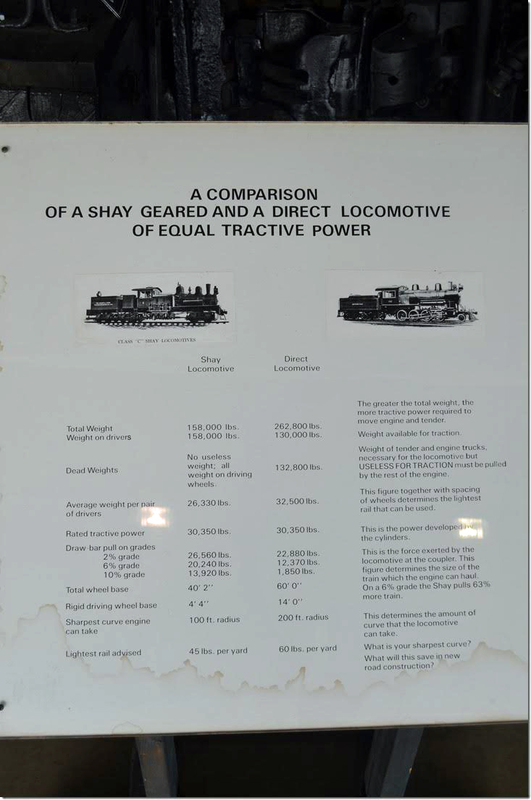 Shay comparison display board. 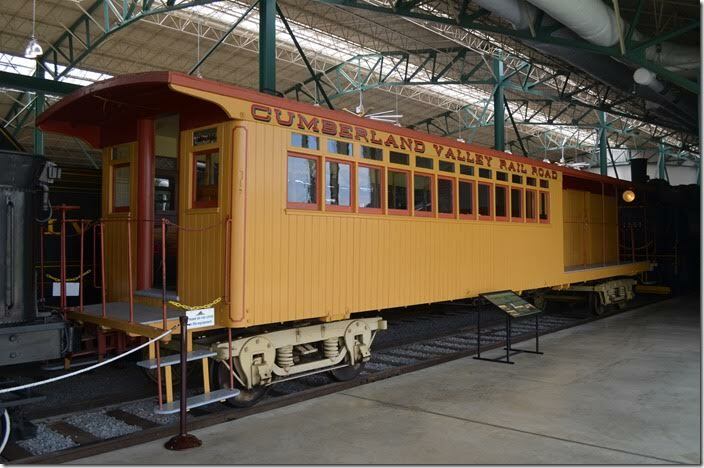 Click on image for a slightly larger view. 14. 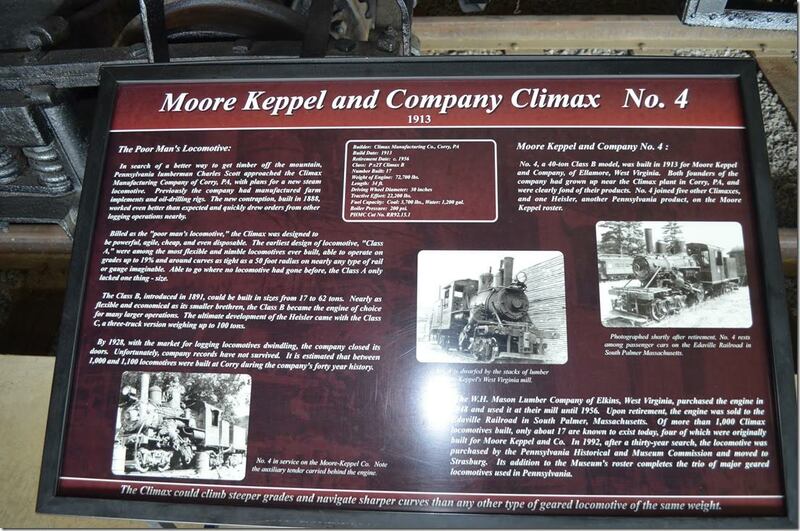 Moore-Keppel & Co. Climax no. 4. 15. Moore Keppel 4 display board. Click on image for a larger view. 16. 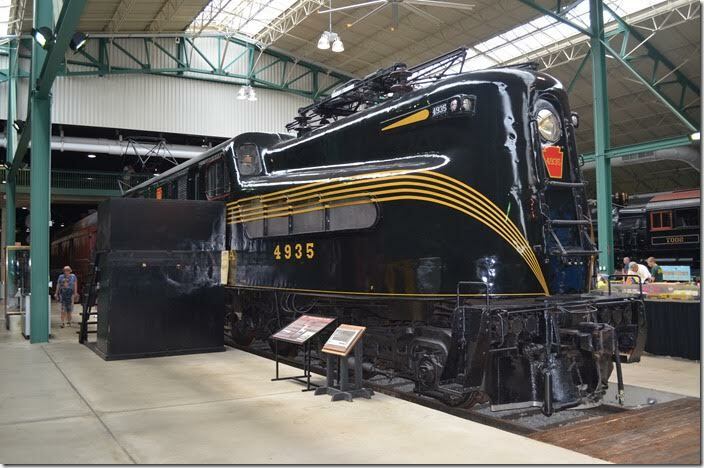 PRR GG-1 4935, the most famous electric locomotive in America. 17. PRR 4935 display board. Click on image for a larger view. 18. 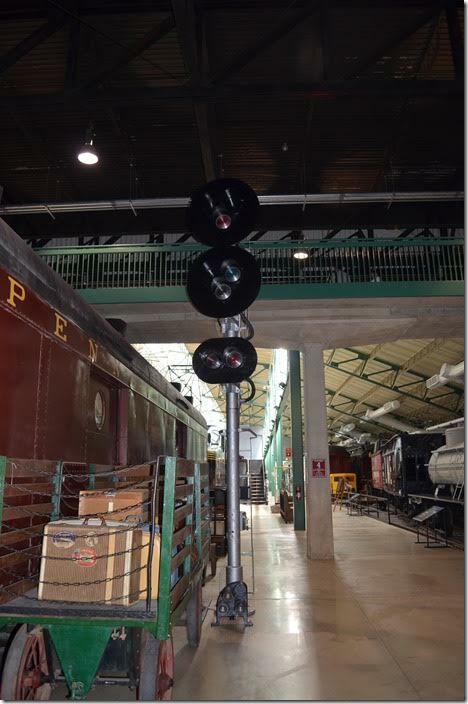 Here’s a parting shot of one of Reading’s distinctive triangular configured signals. 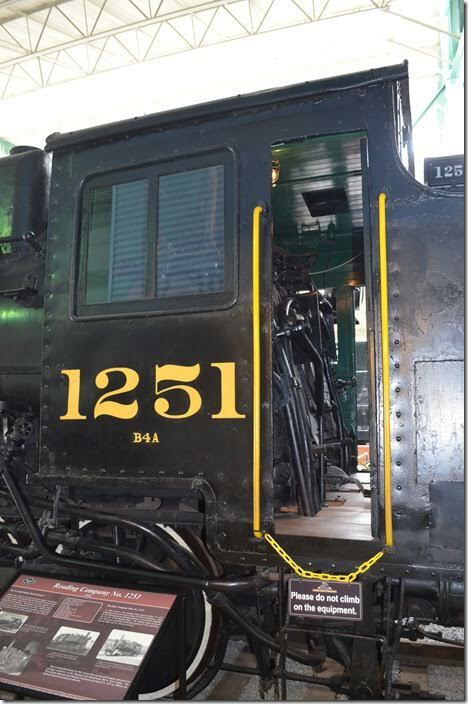 I didn’t photograph the passenger equipment nor some of the other locomotives. They were equally interesting, but my ankles were giving out. Sue wisely stayed in the motel room! There was more to see, but I didn’t have the energy. I purchased a book in the well-stocked gift shop. 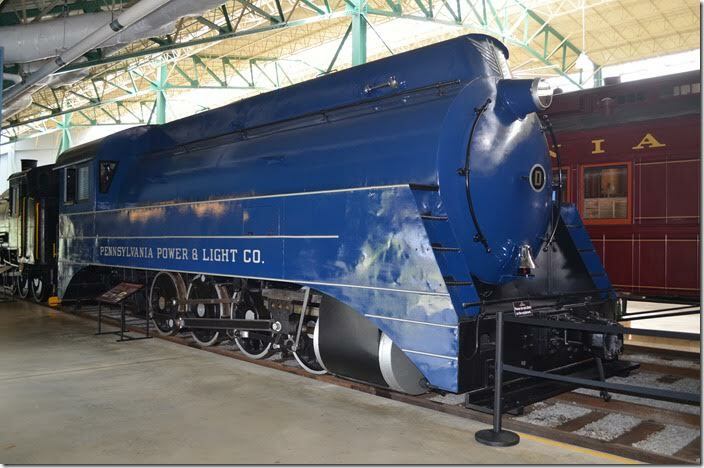 Copyright 2011-2017, CSX Transportation Historical Society.